World War II dominated in the first half of the decade, bringing yet another decade of change. War production created jobs and marked the end of the Depression, and the shortage of men to fill those jobs brought the first major entry of women and blacks into the workforce. The war creating many shortages, including food; food rationing went into effect in 1943. The return of men from the war in 1945 resulted in fewer women in the workplace and, of course, the baby boom. Earlier in the decade, movies like Casa Blanca, Citizen Kane, Dumbo, and Bambi became a popular vehicle for boosting morale and spreading propaganda, as did the rebirth of musical theater with productions of Oklahoma, Carousel, and Annie Get Your Gun. Radio programming also provided entertainment in the form of quiz shows, soap operas, mystery stories, sports, and children’s hours. Later in the decade, radio popularity waned as television became more accessible and widespread. Some popular shows that switched over from radio to television include Red Skelton, Truth or Consequences, and Abbott and Costello. During the war and post-war period that many disillusioned European artists fled to the U.S., leading to the abstract expressionism movement. European musicians introduced classical dissonance; many American born artists remained more traditional. Big Bands remained popular but gradually gave way to the increasingly popular rhythm and blues of Charlie Parker, Dizzie Gillespie, and Ella Fitzgerald. Football: Penalty flags became official (1948); and strategy became much more sophisticated with use of different players for offense and defense. Boxing was very popular because of the gambling . Joe Louis, Sugar Ray Robinson. Women’s Professional Golf Association was formed in 1946. Baseball: Effect of war on sports: Lack of men, rubber, and wood. By 1943, half of all professional baseball players had enlisted, so teams resorted to bringing back older veterans to sustain the sport, which helped to boost the morale of the troops. Jackie Robinson became the first black professional baseball player. Minimum salary for a baseball player: $5500 a year. 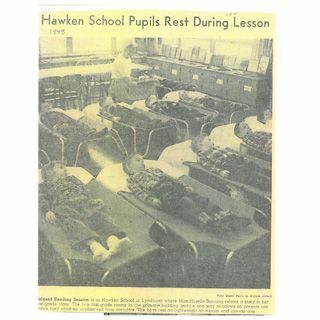 World War II brought losses to many, including Hawken School. Twelve of the more than 200 enlisted Hawken “old boys” who, in MacMahon’s words, were “doing their part to help straighten out the cruel mess in which this old world finds itself” never made it back to Cleveland. They were remembered at a special memorial service held on campus on October 27, 1946. Hawken was impacted by the war in practical ways as well. 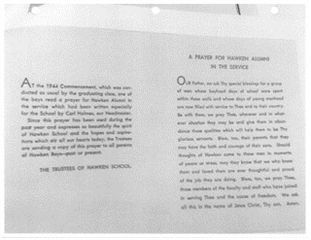 A Christmas letter to Hawken alumni serving in the war dated December 1, 1944 read: “Maintaining a teaching and service staff in times like these has been a headmaster’s headache. The shortage of manpower, withdrawals for various reasons, and the demands of the selective service have wrought havoc in the teaching and service staff the past three years.” But under the able leadership of Carl Holmes, new teachers were recruited, and the staff became “reasonably complete.” Even so, teachers were asked to step up to fill in some gaps; Mort Smeed, for example, added bus driver and art teacher to his resume. 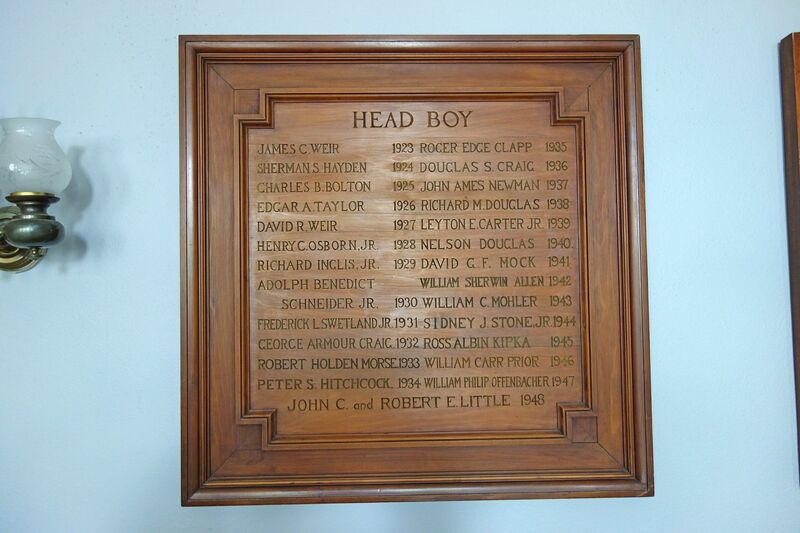 The school made a special effort to keep in touch with the “old Hawken boys” who had enlisted in the war effort. In the Christmas letter from 1943 referenced above, “Mr. Mac” wrote to them of the impact of the war on the School, mentioning the “many little things that have affected our way of life at Hawken, as elsewhere, - things connected with certain necessary restrictions in the matter of gas, rubber, food, and so forth.” But he assured them that they “would be pleased and not a little surprised at how little the School has changed” in all the important ways. He commented that, more than a quarter of later, five of the Ansel Road contingent “still haunt Hawken’s hallways – Stephens, Smeed, Luehrs, MacMahon, and John Ciarlillo.” Ciarlillo, a beloved fixture who oversaw maintenance at Hawken for decades, was known for singing Italian opera in Hawken’s hallways and bending nails with his teeth. 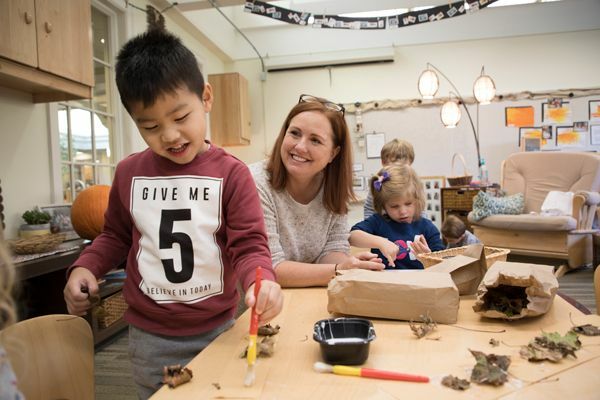 Because the school’s leadership was well aware that enrollment is directly tied to a school’s ability to recruit and retain the best teachers, faculty retirement became another major area of focus during the 1940s. In December of 1940, alumni seeded $1592 for faculty retirement, and the trustees put $2535 toward a participatory faculty pension fund, which was later consolidated with the alumni pension fund. The 1940s also marked the start of organized alumni giving, thanks to James (Jim) Ireland, who was appointed treasurer after expressing concern over the relatively meager $6500 that had been raised through alumni gifts. As treasurer, Jim instituted the “Thousand Dollar Giving Plan,” and alumni giving showed significant growth as a result. Toward the decade’s end, Charles Stephens stepped up as interim headmaster in 1948 when Carl Holmes took a sabbatical year to study other schools around the country, the same year that marked the opening of the new primary building, which was occupied by 26 out of the 186 boys enrolled that year.